Leading drives solutions group, Sew-Eurodrive, is continuing to slash gear-unit turnaround times with the launch of its Australian-assembled Mining Drive. With the acquisition of the new IG facility at the company’s national headquarters in Melbourne, Sew-Eurodrive will be able to offer the locally assembled Mining Drive, providing Australian industry with unrivalled gear-unit access, choice and flexibility. 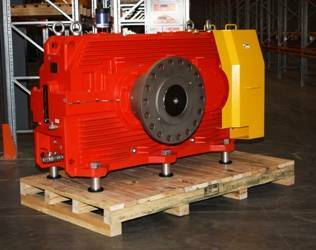 The Mining Drive features bevel-helical technologies and is suitable for motor powers up to 1500 kW. Assembled with a purpose designed thermal housing, the Mining Drive is set to make a significant reduction to energy usage in heavy industry through the lessening of thermal losses. With torque ratings ranging from 58-465 kNm, local-assembly of the Mining Drive will include eight sizes, taking torque range assembled to 175,000 Nm. Sew-Eurodrive’s new IG facility, measuring 10,000 square metres, is being fitted out to assemble and service the largest drives available in Australasia. The state of the art fit out includes cranes capable of handling 50 tonne loads and a storage capacity in excess of 3000 pallets. The grand opening of the facility will coincide with the company’s 30th anniversary celebrations later this year. The Sew-Eurodrive group is a global designer, developer and manufacturer of mechanical power transmission systems and motor control electronics, headquartered in Bruchsal, Germany. Its broad spectrum of integrated solutions includes geared motors and gear units, high torque industrial gear units, high-efficiency motors, electronic frequency inverters and servo drive systems, decentralised drive systems, plus engineered solutions and after-sales technical support/training.